Market Halls is to open a new flagship venue in London’s Oxford Street on the site previously occupied by BHS. The third site for the group will have space for 800 covers over three floors with twelve kitchens, four bars, a children’s play area, events spaces and a demo kitchen. It is understood that the group will also open in Intu Lakeside later in the year and have their sights on a few more London locations before expanding further afield. Taster, a delivery-only kitchen concept that launched in Paris in June 2017 is to open in London following a trial in Hackney. Having worked with a number of consultants, Taster has developed three pan-Asian brands: Vietnamese Mission Saigon; Hawaiian poke bowl kitchen O Ke Kai and Korean fried chicken brand Out-Fry. Working with Deliveroo amongst others they promote themselves as offering ‘restaurant-quality meals’ delivered direct to the consumer. The High Street Sales Tracker (HSST) is a weekly report on like-for-like retail sales which is compiled from retail contributors across the UK. HSST works by bringing together the results of retailers with not only a physical presence but also those with multi-channels and those purely online. BDO collate the data and create a like-for-like measure and through the trends and analysis that they have available, issue a weekly report alongside more in-depth reports. This offers contributors an accurate way of benchmarking their performance against others in the market and against the general consumer shopping patterns. The HSST covers fashion, homewares and lifestyle, in-store and online. Despite the advance of online retail and a testing economy, the number of chain retail outlets closing on Great Britain’s high streets is at its lowest level for seven years, PwC research compiled by the Local Data Company (LDC) reveals. 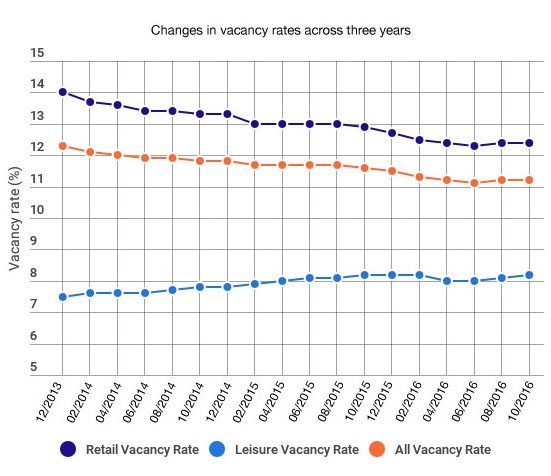 Britain’s retail vacancy rate remained stuck at 12.3% in November. 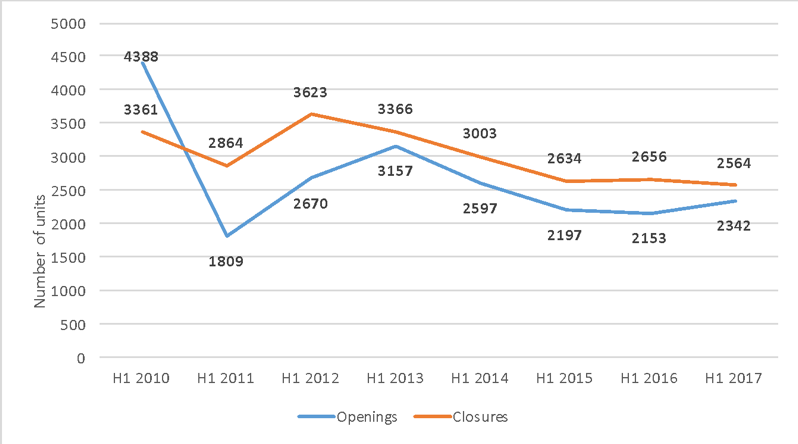 The number of vacant shops has now varied by no more than one in a thousand, net, for the past nine months, new figures from LDC show. Britain’s retail vacancy rate has now varied from 12.3% by no more than 0.1% in the past eight months, decreasing just -0.1% in October from 12.4% in September. 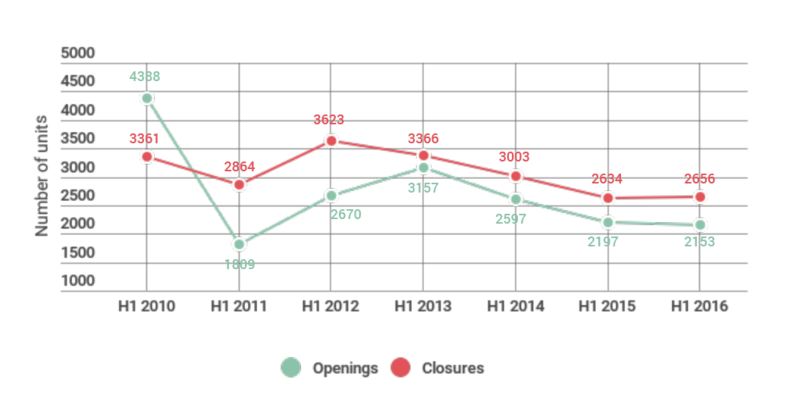 Data released today by LDC and British Independent Retailers Association (bira) shows that traditional independent shops opened slightly more shops than were closed in H1 2016 in Britain’s town centres, whilst the national chains continued to see a fall. Independent shops saw an increase of +4 shops (+0.00%) in H1 2016. 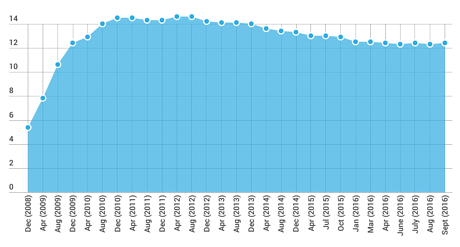 This is a reversal from the net decline of -194 shops (-0.07%) in H1 2015. A net growth of +200 units in H1 2016 on the High Streets, was one of the main drivers in the growth of independent retailing in H1 2016. Retailers closing 15 stores a day as the high street continues to reshape, says PwC and LDC. In the first six months of 2016, 2,656 shops closed on Great Britain’s high streets, a rate of 15 stores a day, PwC research compiled by the Local Data Company (LDC) reveals. Britain’s shop vacancy marginally increased to 12.4% in September from 12.3% in August. Annually this is down -0.5% from the same period last year (September 2015).